This Turkish town is filled with these incredible Disney-style castles, but they are completely empty with no one inhabiting the area. This is the result of what has been widely regarded as a severe economic decline and the plummet of Middle Eastern currency. This charming town, called Burj Al Babas was supposed to be filled with the hustle and bustle of wealthy foreign buyers, ready to indulge in the unique living experience this brand new town had to offer. That day, however, has not quite come yet. It turns out, the developers had pretty radical ways of promoting the town. The mini-castles were supposed to include jacuzzis on every level, underfloor heating and inside swimming pools; but the town is also within close proximity to a plethora of hot springs which the developers claim has healing properties. The properties that were between $370,000 and $500,000, so it’s no wonder they are so luxurious. The project began back in 2014 by the Sarot Group with incredibly ambitious plans. However, these plans were brought to a halt in October 2018 when Turkey’s inflation rate reached 25%; this was an all-time high that Turkey hadn’t experienced for fifteen years. The resulting response by Turkeys banks was to raise inflation, and during this period the value of the Lira plummeted. This was terrible news for the Sarot Group, as well as Turkish residents. Following these events, the Sarot Group filed for bankruptcy protection. This certainly did not sit well with the 350 people who had put in purchase offers on these tiny kingdoms. The project may have suffered a substantial delay, but the New York Times reports that the developers are still very optimistic that it will be a success. They still intend for the project to be ready and complete for October 2019 following expectations that the Turkish real estate market will bounce back, turning what might be a potential financial disaster into everyone’s childhood fantasy. It’s not unheard of to have ghost towns and abandoned properties, although it’s generally more disconcerting once the town has already seen residents and the hustle and bustle of everyday life. Burj Al Babas hasn’t even seen its first resident yet. However, there are many ghost towns in America, such as Thurmond in West Virginia and Rhyolite in Nevada. These types of towns are mostly due to residents having to flee because of economic crises or natural disaster, and not because a group of wealthy developers built a whole town that wasn’t going quite to plan. So there is still hope yet for this small Turkish town filled with the hopes and dreams of potential buyers, with only several months left until their proposed launch date, they have their work cut out for them and not much time left to complete. Their optimism remains strong, though, as there are still buyers that haven’t pulled out of the sale and there remains a market of interest. Perhaps if they added gorgeous gardens in, people might be more drawn to them? 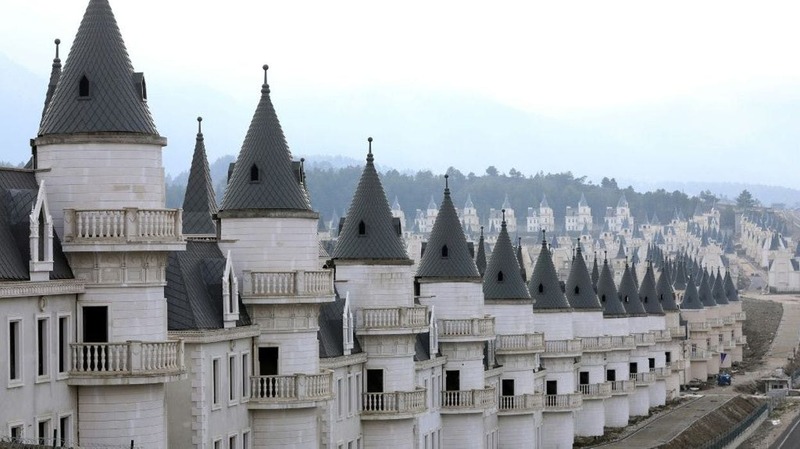 So, if you want a terraced or semi-detached mini-castle, then head on over to Turkey!